The gym gives you access to exercise equipment, classes and other facilities to complete your workout. The best time to hit the gym depends on various factors, including your personal preference and schedule. Exercising at the ideal time for you allows you to maximize the effectiveness of your workout with the fewest number of distractions. Your body's internal schedule and circadian rhythms help determine the best time to exercise, according to the American Council on Exercise. While morning is often touted as the best time to workout, you may feel more prepared to hit the gym later in the day based on your body's cycles. By afternoon, your body temperature is at its highest and your muscles are warmed up. The state of your body may make afternoon a more productive time for you to exercise. Tune into how your body feels physically at various times of the day. If your workout routine feels difficult or unproductive, try moving it to a different time of day to determine if your body responds better. Your personal schedule is another factor in deciding when to hit the gym. Most fitness centers open early in the morning and stay open late into the evening to accommodate members who work. Look at your schedule during the gym's hours to determine the ideal time for you to go. Avoid times when you would feel rushed to get through your workout. Exercising right after you eat can also cause decreased performance or digestive difficulties. A crowded gym complicates your workout. You may have to wait for the specific equipment you want to use or feel rushed when you do make it onto a machine. Classes fill up faster so you may not get a spot. You gym may vary, but a rush often hits the gym right after work because people stop there on the way home. The morning hours before most people head to work may also be busy. If you don't like to exercise in a busy gym, schedule your workout at a less busy time. The gym staff should be able to give you an idea of when the gym isn't busy. Gyms often include classes for its members. The class offerings vary from one gym to the next, but each class is typically held only once or twice a day. Some classes only fall on certain days of the week. 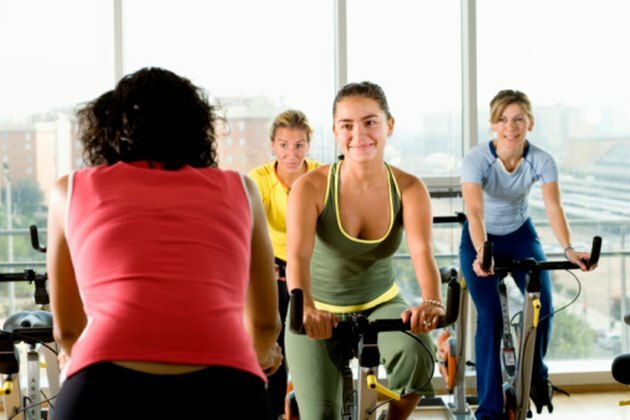 If you enjoy the class atmosphere, you'll need to plan your trip to the gym around your preferred class. Look for a class schedule at the front desk. Working with a personal trainer may also help determine the best time for you to go to the gym. The trainers may only be available at particular times, however.